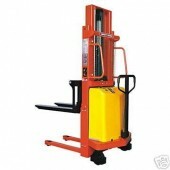 We have a large range of Semi Electric and Fully Electric Stackers from the Standard Stackers for Open Boarded pallets to Straddle Leg Stackers for Open and Closed Boarded pallets due to the wrap around forks at the base of the Stacker. 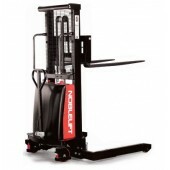 We hold in stock a wide range from 1000kg-1500kg capacities and lifting heights of 1.6m, 2.5m, 3m and 3.5m. 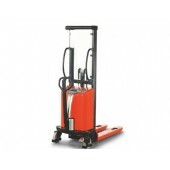 The Semi Electric Stackers are moved manually with electric forks. 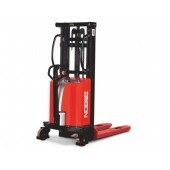 The Fully Electric Stackers are power driven and fully electric fork operation. All products are supplied with chargers operational from a normal UK Single Phase power supply. Please note these products are designed for warehouse use with smooth flooring. Outside use gives excessive wear on the drive wheels which is similar to a car tyres which are replaceable at owners cost as consumables. Electric Stackers There are 22 products. 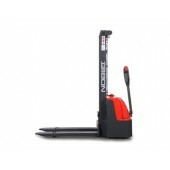 We have only listed below a few of our extensive range of Long Tiller Electric Stackers. The below are the best sellers in the range. Due to customers different requirements and specifications we need to quote on the application. The usual questions are maximum height required for the lift, options of mast being standard duplex or triplex and the lift weight. All of the above contributes to the price of the truck with battery options and service and lease pathways available. We can offer Nationwide Servicing from a fleet of over 600 engineers based throughout the UK. Please do call our experienced sales team for further assistance on 0845 224 0072. We have only listed below a few of our extensive range of Counter Balanced Trucks. The below are the best sellers in the range. Due to customers different requirements and specifications we need to quote on the application. The usual questions are maximum height required for the lift, options of mast being standard duplex or triplex and the lift weight. All of the above contributes to the price of the truck with battery options and service and lease pathways available. We can offer Nationwide Servicing from a fleet of over 600 engineers based throughout the UK. Please do call our experienced sales team for further assistance on 0845 224 0072.